By Comr. Onyegbula Solomon - TBP May 23, 2018 The term "renaissance" according to the English dictionary means reawakening, rebirth or to revive. Biafra as a Nation has gone through so many turbulent times, war inclusive, in a bid for rediscovery and reawakening themselves in what they believe in. Throughout history, there has never been any people or nation that has not had a renaissance, but before the Biafra renaissance can be successful, so many factors need to be taken into consideration and corrective measures applied where necessary. It is unfortunate and most regrettably that the Biafran people found themselves in a country where backwardness, marginalisation, brutalization and dehumanization is the order of the day, where their voices are forced to drown and silenced; where their very identity is threatened, hence there comes an utmost need for a reawakening of the Biafra spirit for a better future. The time is now as there's no better time than now to come out of obscurity, to arise, to stand firm and reach out for freedom; If not Biafra will elude us forevermore. Sane mind would ask "but why a renaissance now?. One of the issues to be considered is the prevalent violence against the Biafran people, in a Nation where they have fought for the common good of all, sane minds would think that Biafrans are ought to be celebrated but the reverse is the case, they are maltreated, assaulted and even get killed, their children orphaned without hope of a future. Another disturbing issue; is the issue of revenue allocation, imagine in a country where the Biafran Nation is the sole producer of the crude oil where Nigeria derives her living and sustainability from yet Biafrans are being denied their right to that effect, unevenly distribution of revenue sharing formula in budget distributions across the 36 States and Capital; unevenly distribution of oil bloc [allocation], this crooked development initiated by the Nigerian government and the British government her ally has therefore hindered any form of development and progress in Biafra land. In addition to these ugly effects is, the disturbing fact that the Biafrans are almost and always excluded in decision and policy making when others are being placed in positions of power, the Biafrans are relegated to the background despite their intellectual prowess; coupled with these is the continuous threat to their fundamental rights. In spite of all these, the Biafrans still try to extend their olive branch of comradeship and compatriots to the rest of Nigerians to which they are always rejected and considered second-class citizens. These disturbing issues are too numerous to mention, is it the wanton destruction of their properties outside Biafra land?. The physical abuse?. The segregation?. The unnecessary arrests and torture?. The unnecessary and unprovoked killings?. The list is endless; though these issues abound with prevailing evidence. Biafra as a Nation is faced with various challenges, both from internal and external forces; the first is the Biafran man's love of money as a result of the very little or nothing he is given or left with by the Nigerian government that subjugated them, crumbs are given to them out of the plenty he has; he loves wealth so much that he is ready to kill just to get it, he goes to any length just to make sure he acquires money which has led to the infamous saying that" if you want a dead Biafran man to get up, you merely wave money at him". Secondly is the lack of unity amongst them which Mazi Nnamdi Kanu had pacified, their inability to speak with one voice. This major factor has put them - Biafrans at a disadvantage level; this is one of the reasons the Biafra Nation is hardly progressing. Another is culture, though culture is one of the things that identifies a particular people, there are some that need to be done away with, for instance, in Igbo culture, some people are looked down on, they are not given certain responsibilities, they are not allowed to mix up with certain people and lots of other things too numerous to mention, despite that these people are specially gifted and can contribute positively for the good of all. One other thing that poses a great challenge to Biafra renaissance is Western influence. Most Biafran sons and daughters who have travelled outside the shores of Biafra land in search of greener pastures, good and quality education have refused to come back to Biafra land to contribute their own quota to her development, instead they live there and contribute to the development of that place, even when they do come back, they prefer to do away with their identity, for instance; their language, their culture and so on. If the Biafran man can overcome all these challenges, they are on their way to a great renaissance and restoration of their lost glory which is Biafra. 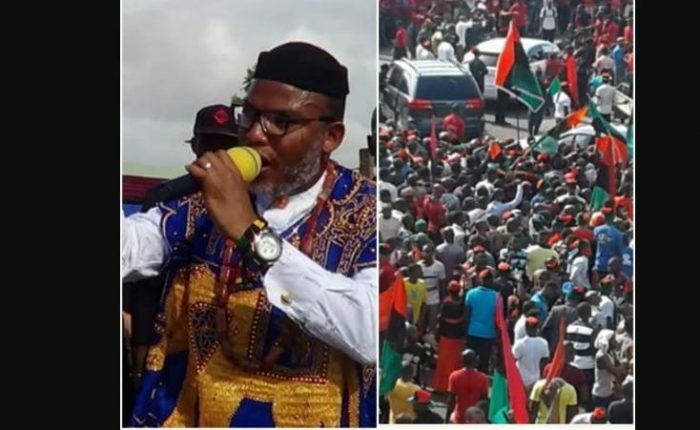 Nevertheless, irrespective of the above challenges outlined, as a Biafran man or woman, Biafrans must be eternally grateful to Mazi Nnamdi Kanu and his Indigenous People of Biafra, who Chukwu Okike Abiama is using to do great things. Today the Indigenous People of Biafra can speak with one voice that what they need is freedom and nothing else but freedom. Today the Indigenous People of Biafra now know better that Biafra restoration is the only hope left for them to behold upon and it is the only assurance of a better life or existence on this planet earth. These and more are made possible by Mazi Nnamdi Kanu and his IPOB. Although these glaring evidences abounds, the Biafrans have prospects, they have a promising tomorrow. Of these prospects, hospitality is one of them, there are no people or Nation that are more hospitable than the Biafra Nation. Their ability to welcome foreigners, especially those with great ideas, stand them out, infact the Biafra man will put himself at great discomfort just to be accommodative to his guests. In addition to this is their creativity. The Igbos have the ability to make something out of nothing even in an unfavourable conditions and this stood him out throughout history. An average Biafran man is known to be industrious, hardworking, there is nothing too big or too small for him to do, he is adventurous, he is ever ready to try out new ideas not minding the cost, as long as it will yield positive results in the end. Above all, the Biafra Nation is endowed with both natural and human resources, too numerous to mention; considering these prospects, one can see the possibility of a sovereign Biafra Nation, where everyone's capabilities will be utilised for the common good of all. The possibility of a place of relevance in Africa and beyond, not only this, of also being a potential member of World Powers in decision and policy making in no distant time.